Just east of Toronto. Just west of Kingston. Welcome to Arts ‘n Tarts! Bakers connect our communities. They share stories about what’s going on and they bring the past to life with heritage recipes. 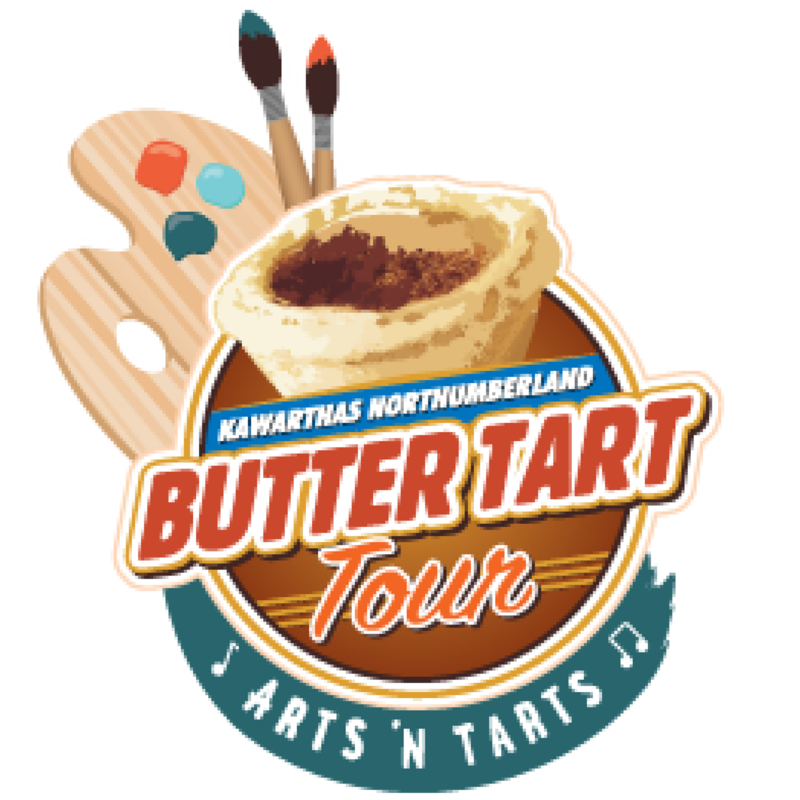 Several of the bakers on the Kawarthas Northumberland Butter Tart Tour have joined forces with local artists, artistic traditions, and studio tours. Some bakers have even created specialty tarts inspired by local arts. The result is the sweet combination of “Arts ‘n Tarts” for visitors to enjoy with events popping up throughout 2018. 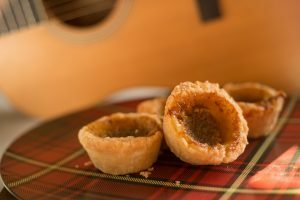 Explore this page to discover the communities and artistic traditions awaiting you across the Butter Tart Tour. Click here to download our handy map which has location and contact info for each bakery on the tour. Some of these specialty tarts can be in high demand, and as the 2018 season winds down some are not as available as they were in the summer. It’s always a good idea to place an order in advance if you’re coming from afar, and keep in mind that ALL these bakers make a wide variety of delicious tarts & other baked goods for you to try! Home to the World’s First Butter Tart Chocolate Bar. It’s no wonder this creative confection was created in the hidden gem of a village called Warkworth. It’s a village populated by artists and makers of all kinds (Check out Ah! Warkworth for what’s happening. ), and Warkworth just happens to be book-ended by two of the sweetest spots for miles around: at one end of town, you’ll find The Warkworth Bakery, and at the other end you’ll find Centre & Main Chocolate. Like quotation marks around a favourite saying, these two shops got together develop something very special. Influenced by their endlessly creative community, they knew it had to be unique, it had to be beautiful, and it absolutely had to involve butter tarts! Following months of sweet experimentation, their creation took shape. Centre & Main Chocolate transforms The Bakery’s award-winning buttertarts and blends them into their most exquisite chocolate. The result is as unique and unexpected as the village in which it was created. The Butter Tart Chocolate Bar is available at both The Bakery and Centre & Main Chocolate. Bars costs $10 each. If you wish to reserve bars for pickup or place an order, please contact Centre & Main Chocolate by clicking here or The Bakery by clicking here. The orchards in & around Colborne are known across Ontario, not least because this area is home to the world’s biggest apple! If you’ve ever driven the stretch of the 401 Highway near Exit 497 you’ve seen The Big Apple. This apple-licious Ontario attraction is home to the 401 Brewery (serving local brews & ciders), a garden centre, market shops, a restaurant and of course a bakery. Learn more by clicking here. The bakery at the Big Apple got together with nearby Hoselton: Art in Aluminum and the Colborne Art Gallery to come up with a stunning specialty tart that embodies the taste and art of the area. 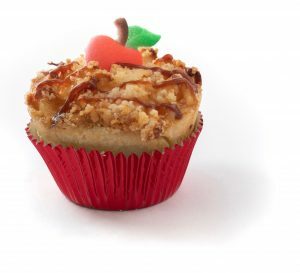 Stop in on your next trip to try the brand new Big Apple T’Art which features apple custard with an apple streusel topping and English Toffee drizzle. 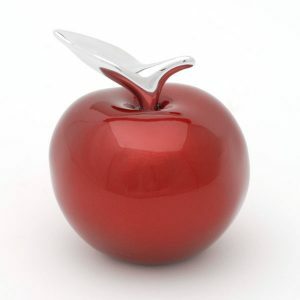 Here is the Red Apple sculpture by Hoselton’s that inspired the T’Art. November 3: Christmas Market exhibition, a show designed with Christmas gifts in mind. Of course, you can always stop by the Big Apple to buy some T’Arts. The Big Apple is donating 50 cents from the sale of each tart will to the Colborne Art Gallery. Hoselton’s will match that up to a total of $500 this season. Here is your Google Map route to all three destinations in Colborne. Discover nearby events on Northumberland Tourism’s Events Calendar – Click Here! 51 King Street East, Colborne. 124 Big Apple Drive, Colborne. 2018 marks the 150th anniversary of Marie Dressler’s birth in Cobourg. Dressler (1868 – 1934) was a Canadian-American comedic actress. She starred in the first full-length film comedy and won an Academy Award for Best Actress in 1931. Dressler’s childhood home is now the Marie Dressler Museum and events are planned in Cobourg from September through to November honouring Dressler’s accomplishments. Stephanie at the Dutch Oven was inspired by this local connection. Honouring Marie Dressler’s “razzle dazzle” this tart is full of strawberries soaked in Ontario ice wine, combined with cream cheese, and topped with white chocolate ganache. Click here to learn more about Stephanie in this “Meet Our Bakers” video. This year’s theme for the Northumberland Hills Studio Tour (Sept. 8-9, 2018) is “Come Fill Up Your Senses,” and pairing this tart with some studio tours in the countryside is the perfect way to soak up this magical time of year. The sunflowers bloom every September in Northumberland County at the same latitude as the sunflowers in France that inspired Van Gogh’s famous series of “Sunflowers” paintings. Stephanie at the Dutch Oven collaborated with the committee that organizes the annual Northumberland Hills Studio Tour. Together they created a butter tart that captures the warmth and colours of the season & Van Gogh’s famous “Sunflowers” series of paintings. Local cermaic artist Melanie Horner (Firing Time) worked with Stephanie on the asymetrical arrangement of spiced peaches, toasted almonds and chocolate ganache, giving this tart an abstract kinship with the colours and shapes of Van Gogh’s paintings. 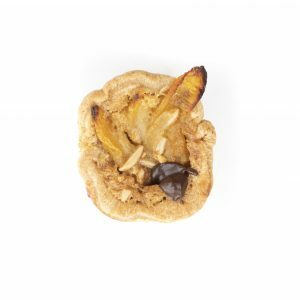 This tart also captures the rich scents and flavours of fall with cinnamon, nutmeg and ginger. It’s the perfect way to fill up your senses with that magical time in late summer/early fall. 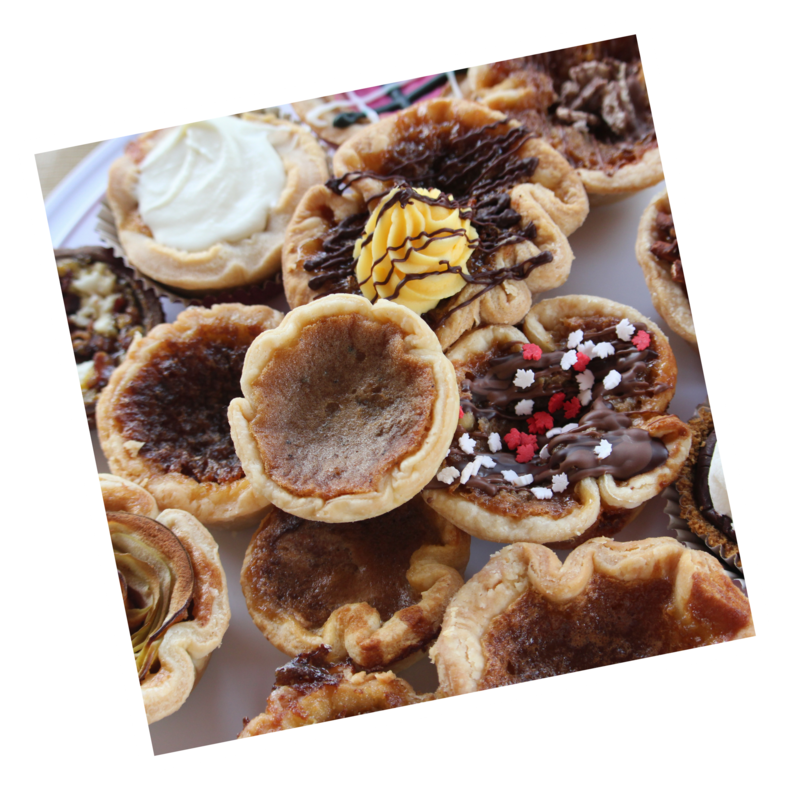 Diane Rogers owns Doo Doo’s Bakery in Bailieboro and she’s known across Ontario for her award-winning butter tarts. In her own words, here is how she came up with the award-winning Stompin’ Tom Whisky Butter Tart. Artistry is as much about the fine arts & the performing arts as it is about the culinary arts. People in Peterborough County are pretty passionate about their local craft beer artisans. The Publican House recently brought home two Canadian Brewing Awards. If you are interested in tasting the best of both worlds, Cassandra at the Peachy Keene Cafe has combined the Publican House Henry’s Irish Ale with her butter tart filling and topped it with some pretzel bits. The Pastry Peddler Cafe sponsors the award-winning local 4th Line Theatre and they wanted to create a tart that shows their appreciation for the theatre. 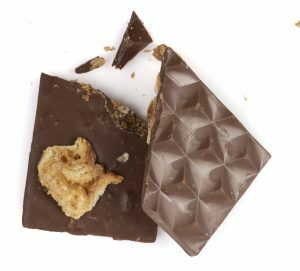 Baker Brad Katz loves Turtles Chocolates, so he sought to capture that flavour in a butter tart. 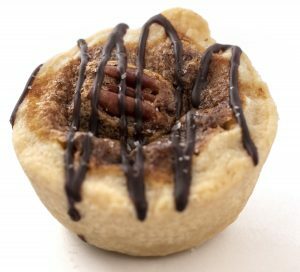 They use the special Pastry Peddler butter tart filling with pecans, adding in some dulce de leche and topping it with Belgian chocolate and sea salt. Read all about it in this great article by the Millbrook Times. Music is so much at the heart of both Peterborough and Bobcaygeon that Janet & Brian (Baked4U in Peterborough) and Kathleen (Kawartha Coffee Co. in Bobcaygeon) decided they wanted to create a sweet tribute to the Hip and Gord. The “Bobcaygeon” song and the concert the Hip did in Bobcaygeon created a shared memory for the small community that brought everyone together just like the Hip brought all of Canada together. 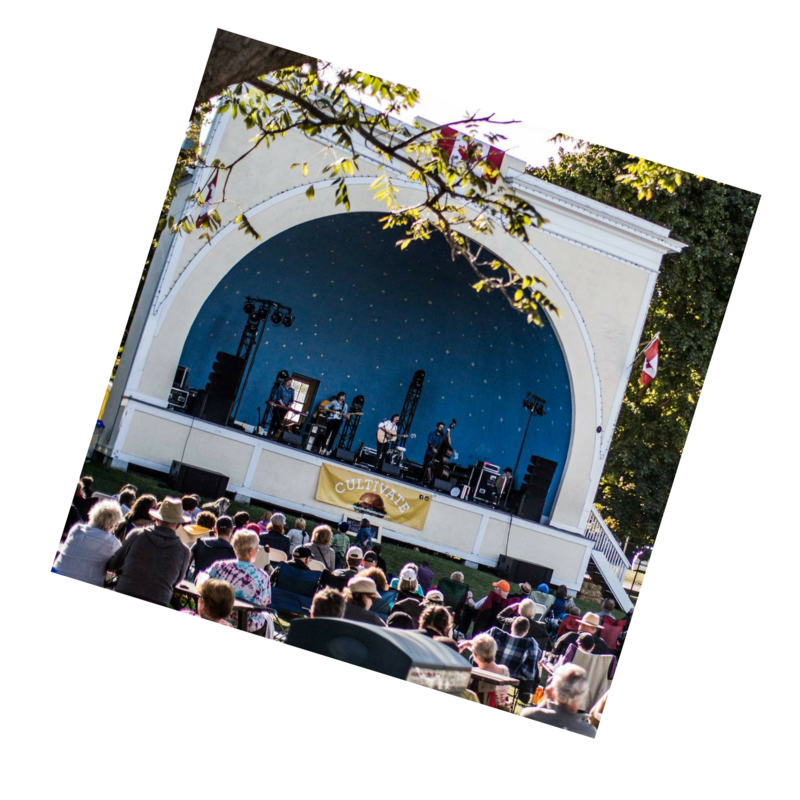 All summer long both Peterborough & Bobcaygeon celebrate music. Thursday evening “Concerts in the Park” happen at the Bobcaygeon Bandstand by Lock 32 on the Trent-Severn Waterway. Peterborough’s Musicfest also has free concerts on Wednesday and Saturday evenings throughout July and August. So a sweet celebration of music and the Hip was naturally the first thing that came to mind for Janet, Brian & Kathleen. They started thinking about what Gord really loved and remembered an interview in which he talked about how he’d like to end poverty and how much he loved fishing in Ontario. When Gord was asked what his biggest guiding star for living life was, he answered that “Life’s too short for bad coffee.” Brian is a huge Hip fan and immediately thought of the “Coffee Girl” song. With that inspiration, the “Coffee Girl” butter tart was created. It features a maple filling with coffee, and a coffee glaze. This tart is available at both Baked4U in Peterborough and at Kawartha Coffee Co. in Bobcaygeon. Kawartha Coffee Co. is a destination on the Kawartha Lakes Arts & Heritage Trail. Learn more here. Inspired by Lawren Harris’ “Decorative Landscape” (1917), Lisa Dixon, Meghan Lee Shew, and Jessica Mabee at Black Honey Bakery and Coffee Shop sought to create a butter tart that captured the warm colours of the painting as well as the earthy tones of the spruce trees and the Canadian Shield. Many artists are inspired by how the Canadian Shield reveals itself in the Kawarthas. This butter tart incorporates locally-sourced honey and spruce tip syrup by Elderberry Herbals. Including Gin in the filling was Meghan’s idea. Gin derives its flavour from the Juniper Berry, adding another authentic flavour from the Canadian Shield. 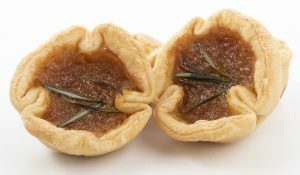 The butter tart is topped with some rosemary leaves, giving it a hint of green and some additional earthy flavour. 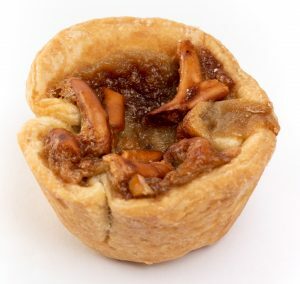 Click here to listen to Nana aba Duncan of CBC Radio Fresh Air taste this butter tart and learn about how it is made. 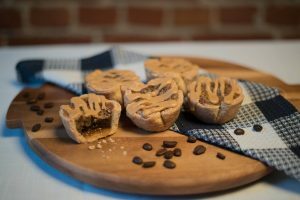 Karen at Kawartha Shortbread in Fenelon Falls created the “Lattice Apple Buttertart” (The LAB Tart for short) to celebrate the Lakeview Arts Barn (commonly called the LAB) in Bobcaygeon. Click here to watch our “Meet our Bakers” video with Karen. Part of the Arts & Heritage Trail, the Lakeview Arts Barn was originally a cattle barn. In 1967 it was converted into a dance hall. In 2006 an extensive renovation transformed the venue once again and welcomed Globus Theatre as the company-in-residence. 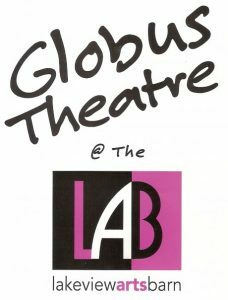 Globus offers summer theatre at the LAB along with dinner on site. 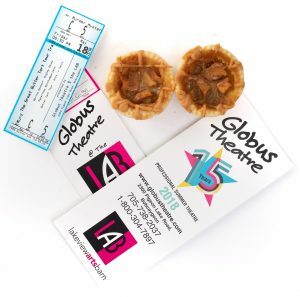 During their 2018 season, Globus created a special Butter Tart Tour murder mystery dinner experience. Sadly all the murder mystery shows are done now, but follow them to catch their next fun show!